The AD515A is a monolithic FET-input Operational Amplifier with a guaranteed maximum input bias current of 75 fA AD515AL . The AD515A is a monolithic successor to the industry standard AD515 electrometer, and will replace the AD515 in most applications. The AD515A also delivers laser- trimmed offset voltage, low drift, low noise and low power, a combination of features not previously available in ultralow bias current circuits. All devices are internally compensated, protected against latch-up and are short circuit protected. The AD515As combination of low input bias current, low offset voltage and low drift optimizes it for a wide variety of electrometer and very high impedance Buffer applications including photocurrent detection, vacuum ion-gage measure- ment, long-term precision integration and low drift sample/hold applications. This Amplifier is also an excellent choice for all forms of biomedical instrumentation such as pH/pIon sensitive elec- trodes, very low current oxygen Sensors and high impedance biological microprobes. In addition, the low cost and pin compatibility of the AD515A with standard FET op amps will allow designers to upgrade the performance of present systems at little or no additional cost. 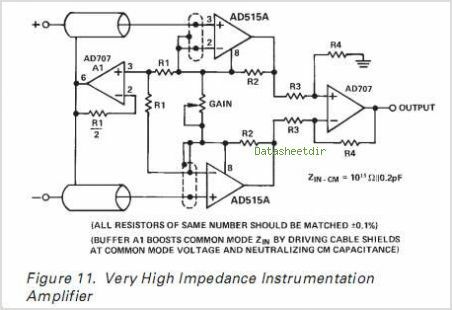 The 1015 common-mode input impedance ensures that the input bias current is essentially independent of common-mode voltage. By Analog Devices, Inc. This is one package pinout of AD515A,If you need more pinouts please download AD515A's pdf datasheet. 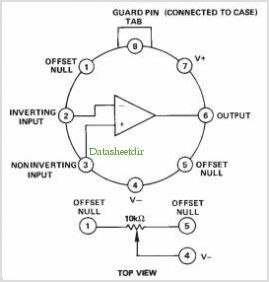 This is one application circuit of AD515A,If you need more circuits,please download AD515A's pdf datasheet.